Cuthbert Tunstall's father was Thomas Tunstal whose first wife was Alice Neville, but she was not Cuthbert's mother. His mother was a daughter of Sir John Conyers of Hornby Castle which is in Hackforth, Yorkshire. At the time of Cuthbert's birth his parents were not married and it appears that, when he was young, he was sent to work as a kitchen boy in the household of Sir Thomas Holland. After working in that role for two years, by which time his parents had married, Cuthbert returned to live with his father who had provided a good education for his son. Cuthbert was educated at Balliol College, Oxford, which he entered in 1491, but it is recorded that left because of the plague. If this is correct then he must have left in 1493 since certainly the plague struck Oxford in that year. We also know that he entered King's Hall, Cambridge in 1496. The fact that there are three missing years here must leave some doubt about the veracity of the story that he left Oxford at the time of plague. Some 50 years later King's Hall became part of Trinity College when it was founded by Henry VIII. Although the length of Cuthbert's time in Oxford is in some doubt, there is no doubt in the fact that he left both Oxford and Cambridge without taking a degree. Between 1499 and 1505 Tunstall studied Canon and Roman law at Padua. Certainly here he gained two degrees and achieved an outstanding reputation as a scholar of great proficiency in Greek, Latin, and mathematics. Near the end of his time in Italy, in 1505, Tunstall visited Rome. On his return to England he entered the Church, obtaining the parish of Barmston in Yorkshire although at this stage he had not been ordained. He was then rector of a number of different parishes such as Stanhope, Durham in 1508, Aldridge, Staffordshire in 1509, before being ordained subdeacon on 25 March 1509 and deacon on 7 April 1509. He was the rector of Sutton Veny, Wiltshire, followed by Steeple Langford, Wiltshire and then East Peckham, Kent. 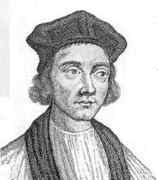 During his time East Peckham he was ordained a priest in April 1511. Archbishop William Warham had recognised his talents in 1509 and arranged a number of positions for Tunstall which brought him to the attention of the court of Henry VIII. He became canon of Lincoln in 1514, archdeacon of Chester in 1515. ... besides a knowledge of Latin and Greek second to none among his countrymen, he has also a seasoned judgment and exquisite taste and, more than that, unheard-of modesty and, last but not least, a lively manner which is amusing with no loss of serious worth. Continuing his diplomatic role Tunstall was ambassador to the court of Charles V and went with him to Aachen in October 1520 where he was crowned king of Germany in Aachen, assuming at the same time the title of Roman emperor-elect. In the spring of 1521 the imperial Diet assembled at Worms and Tunstall was again present along with Charles. After returning to England, Tunstall became Bishop of London in 1522. He wrote the first printed work published in England devoted exclusively to mathematics. It was an arithmetic book De arte supputandi libri quattuor (1522) based on Pacioli's Suma. It makes no claim to originality. Although of strong religious convictions, he was humane and moderate, and was respected even by his opponents in matters of religion. While remaining faithful to the Roman Catholic dogma, he was aware that reform was needed. He would protest decisions of Henry VIII (who often kept him away from London when unpopular decisions were to be made), but once they had been made he would submit. ... since he had explained the calculating of numbers in such an excellent manner. In 1537-38 he served as president of the Council of the North. He officiated at the coronation of Edward VI in February 1547, but his relations with the government became increasingly difficult. A conservative during the Reformation he was imprisoned in 1550 on a charge of treason. At first imprisonment consisted of house arrest, but later he was put in the Tower of London. He was convicted of felony and deprived of his bishopric in 1552. Reinstated the following year by Mary Tudor, Tunstall was deprived again in 1559 after refusing to swear the oath of supremacy under Elizabeth. A gentle man given to collecting coins and gardening, he was probably the most widely respected bishop and scholar in sixteenth-century England.